Assemble the feeding area like on the sketch below. Paint the roof with a clear lacquer spray. Now hang it up using a string, or nail it to a tree. 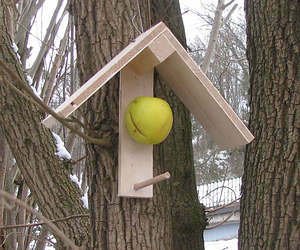 Stick an apple to it and your apple feeder is finished. It is advisable, before using the 2 Spax screws to drill a hole. The roof is secured with nails and some glue. Fix the wooden dowels also with some waterproof glue.